DIY lip scrubs are a lovely thing. They exfoliate and energize your lips, removing dead skin and black heads, while leaving behind clean and well moisturized lips. They’re even more fun when you combine yummy flavors together, like coffee, vanilla and sugar. And that’s what I’ve done today. That’s right, we’re making a vanilla latte DIY lip scrub! It’s pretty simple. You can whip up a batch right before you’re ready to use it, or combine the ingredients, and keep the scrub in a little lip balm jar in the fridge, for a future date. (Although, I probably wouldn’t keep it for longer than a week or two). Combine all ingredients in a small bowl. Lather generously around lips, gently rubbing into the skin for 60 – 90 seconds. Rinse with warm water, and pat dry. Add a dallop of coconut oil or a good homemade lip balm when you’re all done. 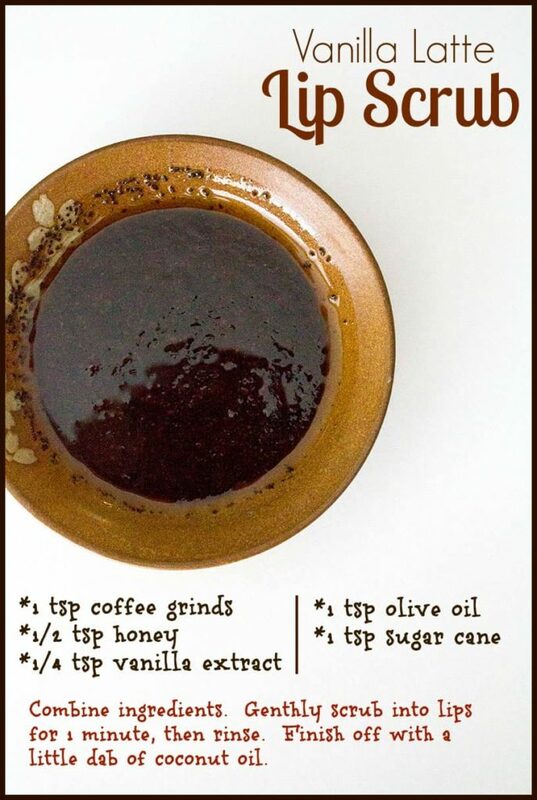 If you’re not a fan of coffee, you can also make this homemade lip scrub with coconut oil, sugar and honey. It’s spectacular, and makes great Christmas or baby shower presents. 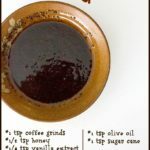 The coffee is a natural exfoliant, which may help remove dead skin and clean clogged pores around the lips. It’s also invigorating and smells good. The honey is a natural moisturizer, and has been known to be an antioxidant and have antimicrobial properties. The addition of honey helps add moisture to dry lips, and may help heal damaged skin. The vanilla extract is really just for flavor… feel free to omit it! The olive oil is another natural moisturizer, and may help keep skin looking youthful. The sugar cane is a natural exfoliant, and lends a pleasant sweet flavor to the mix. I use organic sugar cane, as opposed to regular sugar, because it’s GMO-free, and the grains tend to be a little larger than traditional processed sugar. If you are looking for a way to exfoliate your face, be sure to check out my article on 13 simple exfoliating face scrubs!